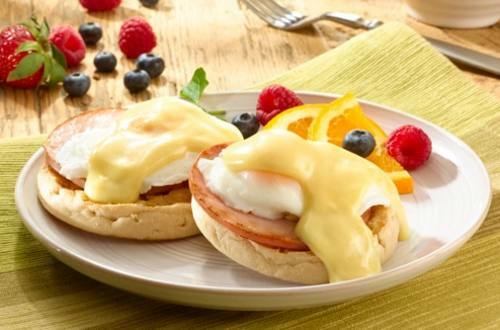 1 Top each muffin half with Canadian bacon, egg, then prepared Knorr® Hollandaise sauce mix. You can serve up slices of this mouthwatering quiche recipe in only 30 minutes. Hearty enough for a main course, it's sure to satisfy any craving- and at any time of day. Try this quiche recipe and watch it become a regular on your dinner menu. Merge two classics and get one great brunch dish when you make this Eggs Benedict Deviled Eggs appetizer recipe.